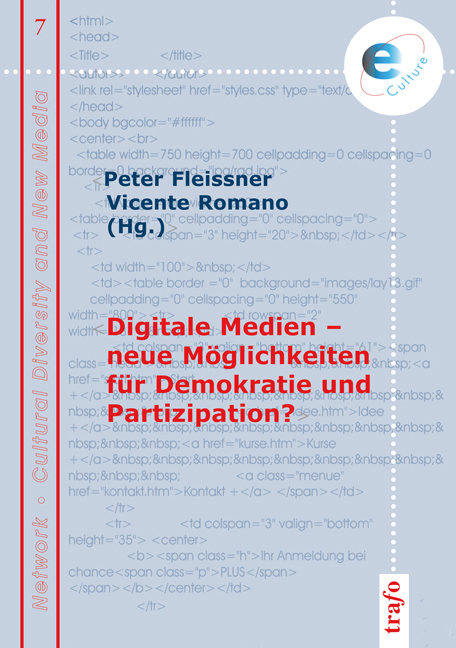 Digitale Medien – neue Möglichkeiten für Demokratie und Partizipation? Der vorliegende Band 7 "Digitale Medien – neue Möglichkeiten für Demokratie und Partizipation?" enthält Beiträge zweier Workshops in Madrid 2004 und Wien 2005, veranstaltet von der Sektion für Kommunikation und Kultur der Stiftung für Marxistische Studien, Madrid, und dem Institut für Gestaltungs- und Wirkungsforschung der TU-Wien, Arbeitsgruppe Human-Computer-Interaction – in Wien aktiv unterstützt von der Leibniz-Sozietät e.V., Berlin. Absicht war (und ist weiterhin, denn im kommenden Jahr ist der nächste Workshop vorgesehen), die sozialen Effekte der Informations- und Kommunikationstechnologien zu studieren. Dabei geht es nicht nur oder in erster Linie um die Vorteile, die die neuen Informations- und Kommunikationstechnologien bringen, sondern vor allem um die Frage, was und in welchem Umfang sie dazu beitragen, dass der Mensch mit Seinesgleichen gut leben und die vorhandenen Widersprüche überwinden kann. Summary: With each wave of new communication technologies people hope anew they can shape society towards more democracy. Actually, the recent wave of ICT and computer mediated communication assists the already politically active person considerably (as one can learn from Omnynews, Indynet and Rebelión). But also some doubts are in place: Up to which point can the Internet really make the citizens independent of the commercial system of mass media? Is it really possible to develop alternatives? The personal knowledge and skills have to be there, but also cheap access to the Internet and related technologies is needed. The world wide digital divide has to be overcome. Summary: In this article the results of two studies of the Bureau of Technology Assessment (TAB) of the German Parliament, "New Media and Culture" and "Analysis of Internet based communication in cultural perspective", are discussed. The results of the studies recommend that one should not look for pure positive results. Instead, one should always consider the relativity of advantages and disadvantages of new media. Technology depends also on the disposition of the individual, on values, norms, expectations and on the general societal framework, which creates a selective environment for the choice of specific types of technologies. Summary: Cyberprotest is an emerging field of social movement research that reflects the role of alternative online media, online protests, and online protest communication in society. These approaches are mainly descriptive and empirical, what is missing is a broader theoretical perspective that embeds the phenomena of cyberprotest into social theory and provides theoretical concepts that can guide research. Cyberprotest is a global hypercycle of the socio-technological Internet system and the protest system. This paper tries to make a contribution to establishing its theoretical foundations by considering cyberprotest within the perspective of social systems theory and self-organization theory. Summary: Media ecology provides a specific perspective on the social costs of technologies and their effects on direct communication. The contemporary reorganisation of communication increases the amount of technical equipment and of information. But the more information- and communication technologies are used, the more they decontextualize human communication and create restrictions to human nature, which needs a broad direct experience of natural and social environments. Democracy as an open space necessarily needs open spaces, where everybody has access to, and that are not reduced by technical means. From there an alternative media culture could be built up. Summary: From an epistemological point of view one can identify a new societal myth: the so called new technologies. They produce a loss of knowledge about the changes, the casualties and the creations in the realm of business, employment, and social relations. Digital information- and communication technologies generate a new way of the production of knowledge: It becomes individualized. For the management it is more difficult than before to assess the performance of a worker by general rules. Technical improvements are not only produced in the laboratories, but in close connection to the practical experiences of the users. Summary: As a background for the analysis of the emergent information society the paper presents a review of processes of commodification and de-commodification of material goods and services. In the context of technology and law the terminology of political economics is used to contribute to the current discussion on Intellectual Property Rights. Objectively IPRs are used as an instrument to create an artificial shortage of information goods, which would not exist if we could get rid of the profitable, but culturally deplorable restrictions the current legal framework provides. To illustrate the perspective chosen, profit making strategies of selected trend setting dotcom enterprises are studied. Summary: The paper presents a dialectical view of the Internet. In an echelon structure the first layer considers Internet as a technology. All the concepts of technology assessment, technophobia and technoeuphoria, technopessimism and –optimism can be applied. On the second level technology is seen as a subsystem of society. A third layer applies evolutionary concepts to the Internet under the dialectical term "Aufhebung" (in German it has three different meanings: removing, storing, and lifting up to a higher level). In a more general context the Internet is seen as a contribution to human intelligence, improving the problem solving capabilities of humankind. Summary: The paper deals with a description and assessment of the information policy of the European Union. The historic Bangemann Report (1994) on "Europe and the global Information Society" shaped the development of the following decades. New initiatives (eEurope, i2010, eAccessibility) where started, partly criticizing the results of the former. Up to now the process of creating a modern digital infrastructure in the member states of the European Union has not come to an end yet. Doubts are raised if with the omnipresence of the new media also their omnipotence should be accepted. Will they really contribute to a more humane and participatory development in the European Union? Summary: Information- and communication technologies (ICTs) have already become economically rather important. Many socio-political studies of the so called "information society" show also their effects in the everyday life of a large fraction of the people of the world. ICTs and the Internet represent a direct productive force. Its potential for changes in production and society has to be assessed more precisely. Objectively, information and knowledge are mechanisms which can undermine the capitalistic mode of production and the capitalistic relations of production (for feudalism money has played a similar role). Without neglecting the contradictions induced by the enduring capitalism, ICTs provide the basis for new relations of production and an optimistic perspective for humankind. Summary: The paper reviews the potential and the limits, the practical usefulness and the related expectations of Internet and networking activities at the occasion of the First Social Forum 2005 in Germany and the Initiative for the Linking of Local Social Fora in Europe. Problems in communication between the actors using e-mails and websites created considerable difficulties for a fruitful and smooth performance of the fora and also differences to the time schedules and resources planned. At the moment Internet is not yet the appropriate media for efficient networking of a large number of Internet users because of its low performance and the dependence on specific browsers and other Internet software. Summary: The critical assessment of the projects "Free Software", "Open Source" and Wikipedia reveals their "communistic" character: They are no longer based on private property. Nevertheless they are in many cases compatible with capitalistic production. The paper presents the pros and cons of the concepts of Free Software and extends them to other areas of voluntary work. Free Software and Wikipedia empower NGOs to improve their performance of administrative and management activities, but many problems remain unsolved. More practical experience is needed to improve further the efficiency of digital media used by NGOs.